Brittany Maynard, a 29-year-old woman with terminal brain cancer, has gone public with her plans to take her own life soon after Oct. 26, her husband’s birthday; she is using her story to make the case for more widespread laws allowing doctor-assisted suicide for terminally ill patients. Maynard moved to Oregon, one of five states that allow the practice, in order to obtain medication for the purpose of ending her life. A Pew Research Center survey conducted last year found that two-thirds of Americans say there are circumstances in which a patient should be allowed to die, as opposed to doctors and nurses always doing everything possible to save the life of a patient. But U.S. adults are more divided about laws that allow doctor-assisted suicide for terminally ill patients, with 47% in favor of such laws and 49% opposed. 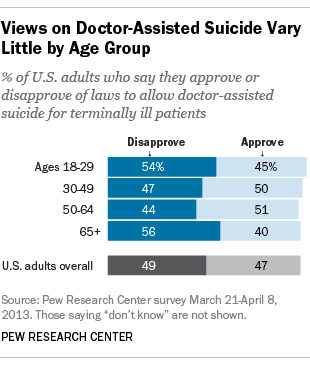 Views on doctor-assisted suicide are little changed since 2005. While there are sizable differences in opinion on this issue by racial and ethnic group, religious group and political ideology, there are, at most, modest differences among different age groups. Maynard’s generation is no more supportive of such laws than are older Americans: 45% of those ages 18-29 approve of assisted-suicide laws, while 54% oppose them. The Pew Research survey also asked several questions about whether people have a moral right to end their own lives in certain situations, and, again, there are no clear patterns regarding how people of different ages feel about the morality of suicide. For example, a majority of Americans (56%) say that a person has a moral right to suicide when the person has an incurable disease, with, at most, modest differences among age groups. The same is true in the case of a person who is suffering great pain and has no hope of improvement, with 62% saying there is a moral right to suicide in such a situation. Clear differences do arise between younger and older people on some other questions about end-of-life issues. Our survey asked people what they would tell their doctor if they personally had a disease with no hope of improvement and they were suffering a great deal of physical pain. Young adults are far more likely than older Americans to say they would want their doctor to do everything possible to save their life — 53% of those ages 18-29 say this, compared with about a quarter (24%) of those ages 50 and older. 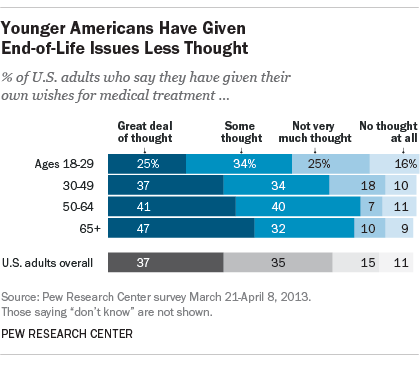 Perhaps unsurprisingly, many young adults have not given much thought to end-of-life decisions. Just a quarter of adults under 30 say they’ve given a great deal of thought to their own wishes for medical treatments at the end of life, while roughly four-in-ten (41%) say they’ve given such matters not much thought or none at all.